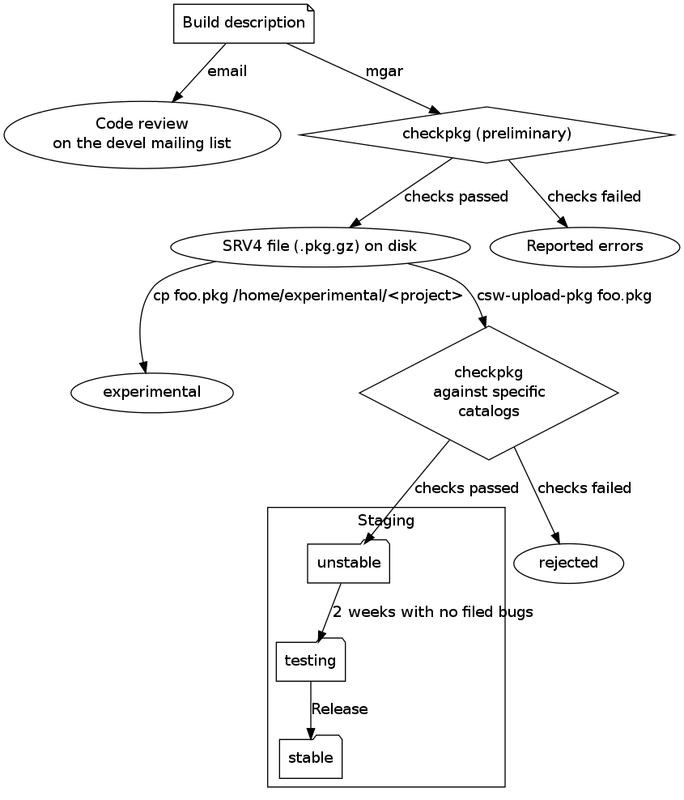 For newer information, see automated release process in OpenCSW manual. As of January 2009, OpenCSW mirrors offer two releases: current and stable1. The unstable release is a symlink to current. In the current release process, individual packages are submitted to the release manager, who updates current. The stable release is not getting any updates, even security updates. It's there only for the purpose of backward compatibility. The main problem is that there are currently no processes that might potentially lead to a stable release. The current branch is never tested enough to qualify for a stable release. Unless the process is modified, there is no way a stable release can be ever made. 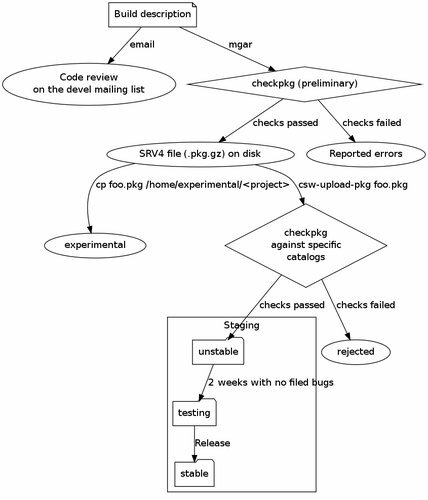 There is a branch called testing, which used mostly by maintainers; its purpose is to make newly built packages available for people to download and try out before they are submitted for release. As of January 2009, it contains a lot of packages and it's not suitable as a whole, even for testing purposes, mainly because it often contains broken or conflicting packages. The modified process should not require much additional work; instead it should help the project separate the wheat from the chaff, so that stable releases can eventually become (more) regular occurrences. There is no manpower to fix all the existing bugs. The goal is not to create a catalog where all the packages are high quality. Instead, the goal is to create a catalog in which the high quality criteria apply to a selected subset of packages. The release branch naming and meaning will be modeled on Debian's: named releases, also labeled as unstable, testing and stable. There's no experimental branch on the official mirror. There are per-project experimental branches available for maintainers to drop packages into. quality level equivalent to the old testing/. Integrated testing is the vital part of the new process. It means that the testing isn't concerned with individual packages, but the catalog as a whole. This would catch things such as shared library linking inconsistencies and conflicting package versions. On top of that, packages must be closely examined by people who understand the packages and can do meaningful checks. With well-defined sets of packages, e.g. a given stable and testing, the upgrade process can be tested. It involves creating a Solaris2 installation with the older branch (stable) and performing Tier 1 (core) packages upgrade to testing. All the upgrade issues need to be either fixed (by pushing package fixes to testing) or documented, with instructions how to work around the problems. See the package tiering page. Users, if they wish to, can subscribe to certain releases and do upgrades as they see fit, instead of us flipping the symlink. This would not be a recommended practice, but if a user believed it would help them, it would be possible. Older releases can stay around for a while, until we remove them. They can be used as a better version of oldpkgs, preserving an older version of stable. All releases would eventually become stable, so the list of past releases is the historic list of previous stable directories. Person in charge of this milestone: Dagobert Michelsen. At this point, there are no major changes for the users. The only change in the release process is that released packages go into unstable instead of current, but this change is not affecting users subscribed to current, because it's a symlink to unstable. In order to make the releases efficiently, we need specific tools. The most important part is bug accounting. Done (Maciej): New individual packages get released into unstable/ using an automated tool. Tier 1 (core) packages in testing/ get tested by respective maintainers: does the configuration migration go OK? Does the application actually work after the upgrade? Introducing package tiering might be quite time-costly by itself. It's hard to estimate how much work it will take; if it's too much work, the Tier 1 (core) set of packages should be kept to minimum and expanded if both necessary and possible. Ideally, the releases would occur in regular time intervals. The time at which a snapshot of the unstable branch is taken might be important. Sometimes, it's not a good idea to take a snapshot of a catalog which has serious problems. If a fix is underway, the release can be deferred by some amount of time (a couple of days or a week). However, it shouldn't be deferred too much, because this might allow new problems to crop out. It's better to make a snapshot of a broken unstable and work on fixing it. The other problem with creating releases is that it might happen that when the release season comes, the last snapshot might be not yet ready for promotion to stable. In such case, the new snapshot would be not made, and the work on the testing release would continue until it's promoted to stable. Only then the new snapshot would be made. 2. Which version? 9, 10 or both?